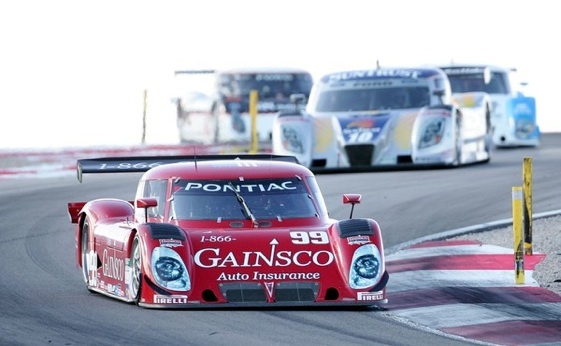 Gainsco gained the Grand-Am championship on Saturday. Alex Gurney and John Fogarty won the championship of the Grand-Am Rolex Sports Car Series after finishing fourth in the season finale at Homestead-Miami Speedway, where Brumos Racing claimed the victory shortly after driver J.C. France was suspended following an arrest on drug charges. Endurance racing legend Hurley Haywood, a last-minute replacement for the suspended France, watched as co-driver Joao Barbosa charged to the front to take the lead in the final 30 minutes. The Sun Trust duo of Max Angelelli and Brian Frisselle kept the title bout close midway in the two hour, 30-minute race when Angelelli took the lead with a little less than an hour remaining aboard his Dallara-Ford. But problems with the tires meant an extra pit stop, which ruined any chances of overtaking the Riley-Pontiac of Gurney and Fogarty for the title. Contenders Scott Pruett and Memo Rojas finished second in the Riley-Lexus of Telmex Chip Ganassi Racing, which was not enough to overtake the points leaders. After the race’s third caution, Barbaso re-started seventh with an hour remaining. Pruett was leading when Barbosa moved past entering the back straight shortly after the two-hour mark. He was not challenged again. The race outcome and championship were both influenced by cautions, which enabled teams to extend their tire wear. Three of the seven , which totaled 24 laps, occurred in the final 30 minutes. “The (Sun Trust) and the (Ganassi) teams were lucky to get a yellow and they were able to get by us in the pits,” said Gurney of the final nerve-wracking hour, which he spent mired in traffic. Earlier, Fogarty had contact with a GT car and then Gurney nearly collided with Barbosa as the two exited the pits. “We knew we were going to have our work cut out for us,” said Fogarty, who started on the pole before giving up the lead to Romain Dumas in the Penske Racing Riley-Porsche. Penske co-driver Timo Bernhard was later penalized on a re-start and fell out of contention. Haywood, a 10-time winner in enduros at Daytona, Sebring and Le Mans, returned to victory lane at Homestead for the first time since 2003, when he co-drove to victory with France in a Fabcar-Porsche. “This will give the team momentum for next year,” said Haywood. Porsche Motorsports North America will not officially support the Grand-Am in 2010, leaving the Brumos team to explore other options for Porsche power.